Levi Strauss Europe, Middle East & Africa commissioned advertising agency Bartle Bogle Hegarty to provide a follow up to ‘Twist’, a campaign introducing the ‘Levis Engineered Jeans’. Levi Strauss had responded to the fall of sale of 501 jeans with this new brand and needed to capture the imagination of a new generation of buyers. The BBH team included creative director Stephen Butler, art director Gavin Lester, copywriter Antony Goldstein, producer Andy Gulliman. Director Jonathan Glazer directed the filming in a conference centre in Budapest, with his Academy Films team including producer Simon Cooper, executive producer Nick Morris, and director of photography/camera Dan Landin. Special effects were developed by post production company Framestore. The shoot took place in June 2001, although Framestore CFC had started the project’s research and development work some time before that. Levi’s ‘Odyssey’ was the first major project delivered by Framestore CFC since its inception at the end of 2001. Leonard Teo and Ali Tezel told the story of the making of the ad at CG Society’s web site, giving an insider look at the pre-visualization stage, the filming, the 3D work behind the wall explosison and computer generated forest. During the filming the actors jumped through physical walls with big gaps (double door size) and real dust and debris shot out of air jets. As the debris hit the actors, they would naturally react to it by trying to avoid the dust and pieces, conveying a certain hardship as the characters broke away from their physical and emotional confines. Apparently it took seven months to make this ad/film. Sam Sneade from Speade provided his editing skills. Sound and music was designed/engineered by Johnny Burn co-founder of Wave Studios in Soho London. Music produced by Jeff Wayne and arranged by John Altman. The music is Handel’s ‘Sarabande’ from the Suite in D minor for solo harpsichord. John Altman employed a late-classical chamber orchestra – 22 strings, flute, clarinet, bassoon, three French horns and timpani. For a reflection of the impact of the sountrack see Norman Lebrecht’s column from February 2002. 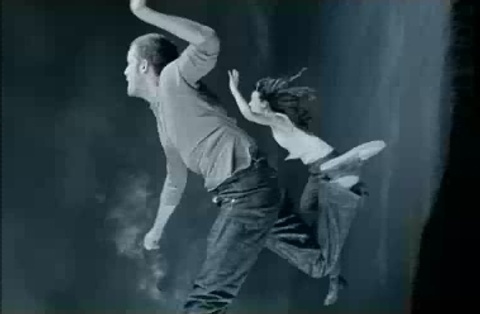 ‘Odyssey’ is one of the commercials featured on Director’s Series Vol. 5 – Work of Director Jonathan Glazer, a DVD released in September 2005. This DVD is a collection of the work of the director Jonathan Glazer and includes his music videos, commercials, short films , excerpts from his feature films as well as commentaries and interviews with the actors, musicians and other collaborators. New original content includes TRAMP and ARTSHOLE both starring Jonathan and Paul Kaye, and a documentary about Jonathan’s work. Commercials on the DVD are Wrangler ‘Ride’, Guinness ‘Surfer’ (extended), Guinness ‘Swim Black’, Guinness ‘Dreamer’, Volkswagen ‘Protection’, Stella Artois ‘Last Orders’, Stella Artois ‘Whip Round’, Levis ‘Kung Fu’, Levis ‘Odyssey’, Barclays ‘Bull’ (with Samuel L. Jackson), Barclays ‘Chicken’ (with Samuel L. Jackson). Not to be missed is the UK Lilt Odyssey spoof in which Jamaican born Brits Blanche Williams and Hazel Palmer, the Lilt ladies, run through occupied rooms and their walls. The 40 second clip directed by Daniel Kleinman (now Rattling Stick) for Mother London features the same soundtrack. This ad was also developed at Framestore CFC but only took two and a half weeks.